A Radio Manufacturers Association(RMA) dummy antenna is a simple device and very easy to construct. The RMA dummy antenna consists of a 0.0002 MFd capacitor that is in series with a 20 uH RF choke. The choke or inductor is shunted by a .0004 MFd capacitor in series with a 400 ohm non-inductive resistor. The RMA antenna sounds more complicated then it really is. I decided to draw the above schematic to help folks visualize this simple device. Keep in mind that a 0.0002 MFd capacitor is the same thing as 0.0002 uF, 0.2 nF, 200 pF, 200 MMF or 200 uuF capacitor. The same abbreviations hold true for the inductor. If you do not have a 20 uH inductor on hand, one can be made by closely winding 49 turns of number 30 enameled wire(magnet wire) on a 1/2 inch diameter tube. The total winding length is approximately 1/2 inch long. Why can't I connect my signal generator directly to the receiver? Do I really need to use the RMA dummy antenna? For receivers that have been designed for an external antenna such as those with an antenna and ground connection and do not use an internal loop antenna, an RMA dummy antenna is desirable so that the impedance connected at the input circuit of the receiver will be approximately that which would appear there when an average external antenna is used. Most signal generators have a very low output impedance, often in the neighborhood of just a few ohms. If the signal generator leads are connected directly to the antenna terminals of the receiver, an inordinately low impedance would now be connected to the terminals, thus shunting the antenna circuit of the receiver. More importantly though, especially for the alignment procedure, the presence of this low impedance changes the resonant frequency of the input circuit. A circuit that has been aligned under this condition would be out of alignment when a normal external antenna is connected. The dummy antenna approximates the normal load and thus provides a some what standard input impedance at which to realign the receiver. The Radio Manufacturers Association(RMA) was originally founded in 1924. Later it became known as the Radio Electronics and Television Manufacturers Association(RETMA). In 1997 the RMA changed its name to Electronic Industries Association, and today it is known as the Electronic Industries Alliance(EIA). The EIA is a national trade organization that includes the full spectrum of U.S. electronics manufacturers. The EIA is a partnership of over 1,300 electronic companies and other high-tech associations with the goal of promoting the development and competitiveness of the U.S. high-tech industry through both domestic and international policy efforts. The products and services offered by the EIA members include items ranging from the smallest and simplest consumer electronics to the most complex electronic systems used for space, industry and national defense. Due to the proliferation and expansion of electronics, the EIA is now divided into many sectors and groups such as the Consumer Electronics Associations(CEA), the Telecommunications Industry Association(TIA) and numerous others. The main office and headquarters of the EIA is located in Arlington, VA.
Capacitor values and abbreviations are discussed below to help with the above schematic. The Farad is a very large unit that is not used often. Most capacitors are rated in picofarads(pF) and microfarads(uF). A microfarad is one millionth of a farad, while a picofarad is one millionth of a microfarad. It is common practice to use the term microfarads down to about 0.0001 uF. The term picofarad is used upward to around 1000 pF(.001 uF). Even though a crossover point does exist, the idea is to try and use the smallest amount of numbers. Nanofarad = nF. These values can be found in all styles except for electrolytic capacitors. 1nF is one billionth of a Farad. Microfarad = uF, UF, mfd, MFD and MF. These values are normally found in molded paper, waxed paper, orange drop, disc, etc., and in electrolytic capacitors. A uF is one millionth of a Farad. In some electronic installations the abbreviation mF could indicate a millifarad, although they are not used much, if at all, in small consumer radios. 1uF is one millionth of a Farad. Millifarad = mf or mF. Hardly ever encountered in consumer radios. Chances are very good that if you encounter a capacitor marked mF that it will be a microfarad and not a millifarad. 1mF is equal to one thousandths of a Farad. 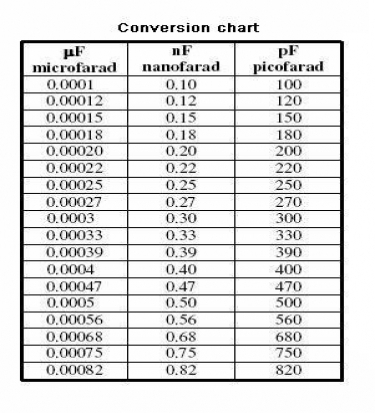 In short, a nanofarad is 1000 times smaller than a microfarad and a picofarad is 1000 times smaller than a nanofarad. 1 Farad is equal to 1,000 mF (millifarad) Not seen in older receivers. 1 millifarad = 1/1,000th (10-3) or .001 times the unit.